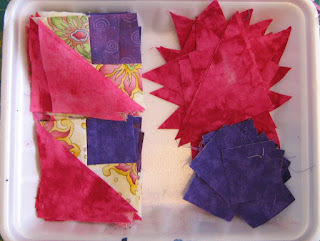 Gift-work continues in Margaret's Workshop...and in the kitchen, too! These fellows were made a couple of weeks ago and frozen. On the menu for today? My batch of Annual Christmas Fudge -- from my tattered copy of the Fun to Cook Book from Carnation Evaporated Milk. I've been making Five-minute Fudge (chocolate) almost every Christmas since I was about eight, and my mother had to help me stir it! 33 Clue #3 Easy Street blocks completed...31 to go! I just love that hot pink! I'm linking up with Monika and the gang for WIP Wednesday over at The Needle and Thread Network -- and hope to "see" some of you tonight when Bonnie hosts Quilt Cam -- 9 p.m. Eastern, 7 p.m. here in the Mountains! Gosh, Margaret! This takes me back. 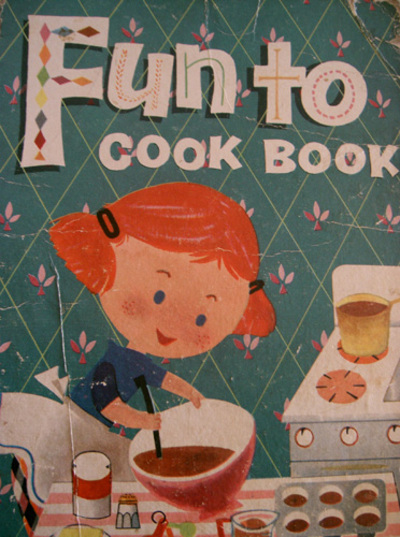 I forget if mine was the same book but I had a little kids' cookbook too. I remember making Peanut butter cookies- using "butter or margarine- Ask Mother what to use!" I THINK my younger sister absconded with that little book when she left home to be married, but it was MY book!!! BTW, yesterday's post hit home too. I had a similar "situation" here but am getting it all Christmas tidy now. MUCH nicer. Happy Christmas, Margaret! Looks like a really busy place in your house. I too love that hot pink. sweet! The fudge and the progress.